Residents at a Pitkerro care home in Dundee have welcomed special guests this week (Thursday 15 February 2018), as children from nearby Butterflies Nursery School visited the care home to interact with them. 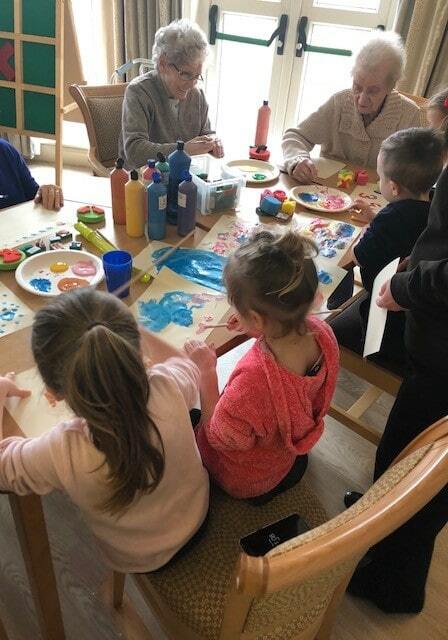 The group of six children aged between two and five years old spent time with delighted residents and took part in activities such as drawing, colouring and making cards in one of the home’s communal rooms. As this is the children first visit, both the care home and the nursery hope that the visits will mark the start of a long association, with further visits to come in the future. They cite the benefits of intergenerational interaction for residents who derive much enjoyment and companionship from the visits, and the children, who have an opportunity to socialise and develop a positive perception of older people. Dawn Soutar from Pitkerro care home said: “Our care home is part of the fabric of the local community and we try to encourage visits from all walks of life, which are enormously rewarding for our residents and also open people’s eyes to just how vibrant and full-of-life a care home should be.